David & Sue welcome you to the Whiteleaf Bed and Breakfast in Croyde, North Devon. The Whiteleaf Bed and Breakfast is a detached 1930’s house situated in the popular village of Croyde, in North Devon. The Whiteleaf Four Gold Star Bed and Breakfast in Croyde has three double bedrooms which all have balconies where you can sit out and enjoy the views of Croyde. 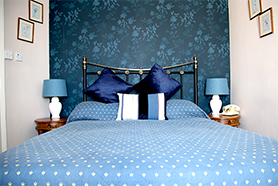 We also have a twin bedded room and a large family room with a four poster and twin beds. All rooms are en suite and equipped with the usual refinements such as tv’s, hair dryers, mini bars and beverage making facilities. 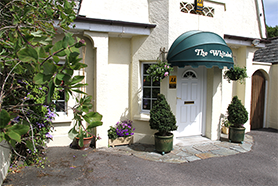 The Whiteleaf is located in the beautiful village of Croyde in North Devon. 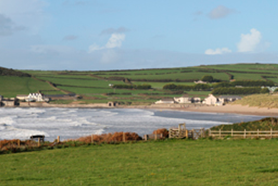 There is so much to see and do not only in Croyde but across North Devon and Exmoor. To help you plan your visit we have listed some of the beautiful places in North Devon you may wish to visit while you are here in Croyde. We are one of the highest rated Bed and Breakfast's in Croyde and the North Devon area so you are assured of a quality stay when you visit. We welcome surfers, walkers and families and well as couples and people travelling alone. Please call us on 01271 890 266 for the best rates.